Special Containment Procedures: SCP-4777-1's remains are to be preserved in the storage facility at Site-177, and are not to be disturbed for testing without approval from personnel of Level 3 authorisation or higher. It is believed through historical analysis and on-site testing, that SCP-4777-2's remains have fully decomposed into their supposed burial ground at Arbour Hill Cemetery, Dublin, Republic of Ireland. This site is to be examined for any anomalous activity on an annual basis under the guise of gas pipe maintenance. The location of SCP-4777-3's remains is currently unknown. A search for these remains was carried out (1993-2017) but proved unsuccessful. SCP-4777-4's remains are to be preserved in the storage facility at Site-177, and are not to be disturbed for testing without approval from personnel of level 3 authorisation or higher. Description: SCP-4777 is the designation given to all known individuals who have both partaken in a full SCP-4777-A event and have identical genetic code to the Irish republican and socialist leader James Connolly (this particular individual being designated SCP-4777-2). Individuals included have been observed to retain a partial memetic connection to previous SCP-4777 instances. SCP-4777, despite aging at an ordinary rate, when tested through means such as carbon dating, retain an identical anomalous biological age. SCP-4777 have been observed to approximately predate the Norman invasion of Ireland. The subject is born at 05/06 in any year. The subject becomes involved in the planning of any form of armed conflict, primarily on the island of Ireland, and is present at one of the conflicts that take place as a result of the rebellion. The subject is severely wounded in any way, shape, or form, during the armed conflict they are present at. The subject either dies of their wounds, or is executed shortly afterwards. This has occurred at the age of 47 on several occasions for unknown reasons. Notes: SCP-4777-1 was born in Northern Ireland under the name "Edward McNally". SCP-4777-1 came to attention when it became actively involved in local trade unions, rising in political prominence before it was detained. See addenda. Sources: SCP-4777-A1 was listed in the official census of its country of birth several times. SCP-4777-A1, has a medical record, a driver's license, a bank account, and is listed on many other official documents. See interviews below for more information. Despite previously being known to the public, SCP-4777-A1 was gradually mostly erased from general public knowledge in a successful disinformation campaign by MTF-707-Mu ("Irish Citizen Army") designated "Operation Starry Plough". Recorded Time Period: 05/06/1868 - 12/05/1916. Notes: During SCP-4777-A2, SCP-4777-2 went under the name "James Connolly". SCP-4777-2 was born in Scotland, becoming an Irish Republican and socialist leader involved in a multitude of political activities, until being executed by firing squad due to involvement in the attempted Irish rebellion that took place in Dublin at the year 1916. Sources: SCP-4777-A2 has been documented by an extremely large variety of sources, being the only SCP-4777-A event that the general public is aware of. The sources describing SCP-4777-A2 can easily be found in abundance in the public domain. Thus far, no reason has been seen for a possible counter-information campaign regarding knowledge of SCP-4777-A2. Recorded Time Period: 05/06/1820 - 05/04/1867. Notes: Subject was born in the Republic of Ireland under the name "Joseph Connolly". SCP-4777-3 originally worked as a labourer on a small farm, until moving into a workhouse due to the Great Irish Famine. Many of the details of SCP-4777-3's life are unknown, but it has been recorded that SCP-4777-3 became a member of the Fenians, assisting in the organisation of the 1867 Fenian rising, where it was recorded being shot in an armed engagement between the rebels and police, dying of infection shortly afterwards. Notes: No information has been found on SCP-4777-4's birth or origin. 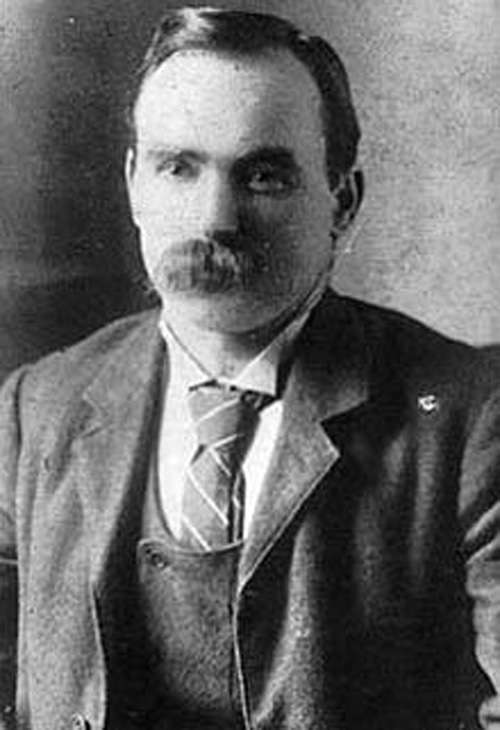 It has been recorded that SCP-4777-4 was named "James Connolly", and was a member of the Society of United Irishmen. According a historical source, SCP-4777-4 fought in the battle of Ballinamuck during the 1798 rebellion, being injured and then being executed by government forces by drowning in the nearby bog. Sources: SCP-4777-4A is only described in the diary of Thomas McCracken, a rebel who also fought in the 1798 rebellion in Connaught. In the diary, SCP-4777-4A is described as being a close friend to McCracken, having a personality and mannerisms identical to other SCP-4777 instances. SCP-4777-4's remains have been discovered, and after genetic analysis have been recorded to have identical genetic properties to all other tested SCP-4777 instances. Notes: SCP-4777-5 is described as being a member of an Irish clan that united with Prince Edward Bruce, under the name "Lord Gerald O'Neill". SCP-4777-5 is described as being present at the Battle of Faughart, being wounded and later dying of its injury. SCP-4777-A5's existence has little confirmation. Sources: SCP-4777-5 is only mentioned as being a prominent member of an old Irish clan who joined forces with Edward Bruce against Anglo-Norman control, in accounts taken by a single 14th-century writer as being wounded in battle and dying of his wounds a day later. Interviews 4777-1a to 4777-1b: The following list contains interviews with SCP-4777-1 organised and carried out by MTF-707-Mu. Foreword: Initial interview of SCP-4777-1a conducted for the purpose of gathering general information on SCP-4777-1's relation to other SCP-4777 instances. Dr. White: Good morning, Mr. McNally. SCP-4777-1: Good morning to you too… Doctor? Dr. White: Doctor White. I'm here to assess your situation and hopefully clear a few things up, Mr. McNally. I understand that you must be quite confused. SCP-4777-1: Well you're damn right I'm confused. Please ask all the questions you need, but know that I've got a few myself. Dr. White: I'll try to answer any queries of yours as well as possible. SCP-4777-1: Mhm. What in hell is going on here? Dr. White: You're in a research facility of sorts. We're keeping you here for a scientific study into the possible connection between your mind and body with a few historical figures. SCP-4777-1: So you actually think that I'm James Connolly? And that there are three of me? And that I'm… Some sort of time traveler who fought in the 1798 rebellion AND the Easter Rising? Pfft. Dr. White: We also have evidence that "you" participated in the Fenian movement, and a rebellion in 1308. SCP-4777-1: Hold on, hold on. This is a joke, right? Dr. White: I'm afraid that this is no joke. SCP-4777-1: Christ almighty… You people seriously believe this. Me? Time-traveling James Connolly? You know that scene from Back to the Future? SCP-4777-1: At the end of Back to the Future, you know when Doctor Brown just barges in on Marty and Jennifer in a time machine and begins talking nonsense about the future dressed like some sort of clown? Dr. White: Ah yes, I am familiar. Sorry. SCP-4777-1: It's no bother at all Dr. White. Anyway now I'm interested in seeing where this goes. Dr. White: You seem incredibly calm about this right now. Care to try and explain why this might be so? SCP-4777-1: I do? Well, if that's true I'm not sure why to be honest. It hasn't really sunk in for me yet. Dr. White: Or maybe you're calmer that you expected because you felt this was somewhat the case? SCP-4777-1: Umm, well… Maybe? Like, when you told me all of this, it somehow felt like a familiar fact? When you mentioned the Fenians, even that thing in 1308… It could just be the placebo effect. SCP-4777-1: God I've never thought about it like this but it feels like I'm staring into my own face. Dr. White: No wonder, since you are practically facially identical. Dr. White: Would you say that these kinds of feelings of attachment, lead you into socialist politics, on reflection? SCP-4777-1: I couldn't give you a hard and fast answer to that one, doctor. Dr. White: I see. Try to think about it. SCP-4777-1: Hmm… When I try to focus on it, I keep seeing one image- I don't know why but I keep envisioning being in a green forest. Dr. White: You are probably just overthinking things at this point. SCP-4777-1: Yes, probably. Actually, can I get an official name change here? Dr. White: Well, we do have the resources to do that if it'll help. What do you have in mind? SCP-4777-1: I was thinking that if I changed my name to James Connolly, something would become clearer? Dr. White: I'll see what I can do. That's all for now. Closing Statement: SCP-4777-1 has described a form of mental link to previous SCP-4777 instances. Foreword: Further investigating of the conclusions of the previous interview. Dr. White: Well hello Mr. Connolly. All you need is the moustache now, mmm? SCP-4777-1: Haha, yes, I'll get that sorted out. You might be interested for your research, this name feels far more natural than my previous one, even though I've only had it for a couple of days. Dr. White: Very interesting indeed. Are you enjoying your new liberties on the site? SCP-4777-1: It is a very interesting place. The gym is good too. I'd appreciate more though, I personally still feel too much like a prisoner with all the restrictions. I haven't seen many windows… Are we underground? Dr. White: Some of the complex is. I've been told that you're mixing well with some of the personnel here at Site-177? SCP-4777-1: Yes, there are many nice folk around. Dr. White: And I understand you've set up a sort of "trade union" among staff? SCP-4777-1: That we have. Would you like to sign our petition for fairer working hours? Dr. White: We'll discuss that after the interview. Now I understand you have been using the dream diary we gave you, and the results have been rather interesting. Care to explain? SCP-4777-1: I've been having dreams of what you were on about last time we met. Yesterday night I saw myself in the fighting of the Easter Rising, a couple of nights before then I saw the great famine. Felt so real too, like a flashback. Dr, White: Well surprisingly enough your accounts more or less match the records of your "previous selves". SCP-4777-1: You saw my entry about the druids, right? I had a dream that felt just as real as the others. I was in the middle of a beautiful green forest surrounded by druids. Whenever I remember that dream I get this strong sense of purpose. Dr. White: In our last interview you mentioned a forest. And it is possible that you originated from a time period where druidic orders were still largely in existence. SCP-4777-1: It felt like something important, and that feeling of having a sole reason to be here… I don't know, you said it was around the Anglo-Norman invasion right? When you think I originated from. Dr. White: Indeed. What kind of purpose do you feel? SCP-4777-1: I don't know, something like freedom? That throughout the history of Ireland we've had a long series of rulers and totalitarian regimes, and that it's my job to keep standing up to them. Dr. White: Maybe. Thank you for your time, Mr. Connolly. Closing Statement: It can be concluded that SCP-4777 instances share a mental link to their previous instances, being able to access each other's memories. I have watched in alarm as SCP-4777-1's containment privileges have become increasingly relaxed, far more than normal. These additional special containment procedures are not a necessity, we do not need to give SCP-4777-1 this much leeway. But still the Site Directive chooses to allow SCP-4777-1 to roam around the site and socialise with staff, for the purpose of "boosting morale". Access like this is almost never given on the grounds of "boosting morale" alone. As you may know all SCP-4777 instances have had a history of being extremely charismatic. From my experiences in communicating with the entity on-site I can confirm this, SCP-4777-1 has a way with words. But sometimes I find myself questioning this: everything he says feels too agreeable. Why has the Site Directive chose to accept his requests of lighter containment so hastily, and how he has already managed to become the centre of a large social circle of Site-177? Michael Collins, an Irish revolutionary who fought under SCP-4777-2 during the Easter Rising, emphasised his charisma saying that he and his comrades would follow him to hell if they had to. Perhaps there is more to this than a silver tongue? I am suggesting that SCP-4777-1's recent containment allowances be revoked as soon as possible, because at the rate events have been going I fear that this may continue to progress to extreme extents. SCP-4777-1 was sighted handing out leaflets with several members of site maintenance staff, as is often done each morning on a daily basis. These leaflets contain propositions of higher working standards for ranks of on-site personnel. An unexpectedly large crowd of staff had gathered around SCP-4777-1. As the crowd grew in size the movement spread throughout the site. Personnel began leaving their posts in organised groups, vandalism of site property, chanting, and later release of detainees, all began to increase. Personnel spoke slogans such as "freedom of speech", "give us our rights", and "secure contain exploit". The movement initiated by SCP-4777-1 had grown to the point of being considered a threat to the safety of the site, and a riot control security team of 10 personnel (177-SFB) was deployed to detain and contain SCP-4777-1. 177-SFB was met with heavy resistance by the crowd, having to withdraw after being assaulted by a large number of hostile site staff, sustaining two injuries from the engagement. The crowd, after this, intensified and quickly grew more violent. The crowd started constructing crude barricades blocking hallways leading into the centre of the site, being defended by staff armed with heavy thrown objects, molotov cocktails, gas grenades, poles, batons, and various firearms. This force had now captured a large portion of the site, including its entire central laboratory, which they quickly began to fortify. Another, larger security force had been assembled consisting of 42 members. This force attempted to subdue the riot in the central laboratory complex, but was unable to fight the growing crowds and was pushed back to the southern warehouse where they were forced to retreat after sustaining 3 casualties and 6 injuries. Workers of Site-177. You have been mistreated, deceived, threatened, and put to work under dangerous conditions for a limited pay that you can't even spend properly without your employers going up your backsides with secrecy and whatnot… It's a joke. Many of you are forced to work with hazardous substances that could end your life in the blink of an eye, some of you lowly janitors have even risked your lives for this foundation several times! And what do you get in return? Separation from your families? Low wages? A contract that is no better than serfdom? A concrete cell to sleep in? Are you any better than the human test subjects they herd into pens like cattle for experimentation? And why. because they don't trust you to not spill the beans? After all your toil, all the faith, they don't trust you. A reaction force consisting of 6 armored vehicles including one light tank, two combat-based Mobile Task Forces (MTF-137-Gamma and MTF-055-Nu), and three riot control divisions was sent to Site-177 to subdue the event. "Alpha", consisting of MTF-055-Nu, two riot control divisions, and 4 armored vans mounted with water cannons was to attempt to breach site through its conventional entrance at the south wing. "Beta", consisting of MTF-137-Gamma, one riot control division, one armoured van, and a light tank mounted with CS gas launchers and a high pressure water cannon, were to breach the site from its north-east wing 10 minutes after the deployment of Alpha. This force would have the aerial support of strike drone SD-37774 if necessary. MTF-055-Nu: Site-177, this is MTF-055-Nu of the emergency response force. All personnel are to evacuate the site unarmed and give themselves in to foundation custody. C-54599: Hmm, no need for that anymore really. We're fine thanks. C-54599: No need for that either. Sorry but we got tired of being your slaves, the workers of Site-177 are standing up for themselves, so I suggest you move on. MTF-055-Nu: What is your situation? C-54599: Sunshine and rainbows. Like I said, we're running this site now. We don't need you lot interfering. After their signal was cut off, Alpha used small C4 explosives to breach the gate. The explosion from this triggered an improvised explosive booby trap causing several injuries. Alpha then moved into the courtyard of the site, and came under light fire. A small firefight ensued causing a fire in the South warehouse. Beta reached its checkpoint at the north-east watchtower entrance. Seeing that the gate had been barricaded strongly by rioters, SD-37774 fired a small ballistic missile at the base of one of the north-east walls opening up an entrance which enabled Beta to enter the northern courtyard. They reached the east side of the central laboratory complex before being met with heavy resistance by a large crowd of rioters. Beta's light tank arrived later and cleared the hallway for a great distance. The fire that had engulfed the southern warehouse had now spread to the central laboratory complex. The event at this point had resulted in at least two containment breaches excluding that of SCP-4777-1. After proceeding through fire and patchy resistance from rioters, Alpha reached the central laboratory complex. The remaining Alpha forces, upon traversing a hallway to the building's cafeteria, which was the presumed the centre of enemy operations, was ambushed by a group of twelve armed rioters. After a casualty-heavy gunfight, Alpha was forced to withdraw to defensive positions within the southern courtyard with support from SD-37774. Beta reached the cafeteria. Within they met heavy resistance and gunfire, while being attacked by rioters using petrol bombs. In a large clash that ensued, Beta, remaining scattered security personnel, and scattered Alpha forces confront the central concentration of rioters. During the fighting, SCP-4777-1 was wounded by a stray bullet. Roughly an hour later the clash had finished and the rioters had scattered. In this engagement, Alpha, Beta, and the securities sustained 9 fatalities and at least 20 injuries. After the engagement, 67 rioters had been detained in the following hours. A mop-up operation was later preformed after reinforcements in the form of 2 combat divisions were brought in, and the riot was ended by 13:00. Concluding Comments: The incident at Site-177 conceded a total of 43 fatalities on all sides, the majority of these being of rioters. Large amounts of site staff were injured and detained, and all objects that had breach containment during the event have been recaptured. SCP-4777-1 expired of its wounds a day later, and is now classified as neutralised. For his partial responsibility for the event, Site Director Boyle is currently awaiting demotion. Mass demotions or other form of disciplinary action are currently being organised by the new site directive. 1. It is worth noting that despite sharing the same surname, SCP-4777-2, SCP-4777-3, and SCP-4777-4 are not direct descendants.